Simple solutions and techniques to keep editing easy for the beginning editor. Editing video can be such a hassle BUT it doesn’t have to be. Yet to really communicate effectively with video you almost always need to add some edits. There are very simple solutions and techniques to keep editing simple and easy without having to be a video professional. Through my years in video production, I’ve had many tight deadlines to turn a video fast. Most of the time producing a video is spent editing it. It’s a creative endeavor and you can waste a ton of time perfecting every single piece of your video. It’s all about the preparation! Before you begin an edit, have a plan of action. Whether you’re producing a class tutorial, marketing video or lecture series, it all comes down to what you hope to accomplish in your video. Oftentimes, getting your point across in a script is exactly what you need to save time. A script provides an organization of your thoughts and keeps you from wasting time on unnecessary edits. The best advice is to find a tool that fits your needs. If video editing isn’t in your career field then find something that’s easier to use. Similar to taking pictures on your iPhone, modern video editor tools have become so easy and powerful you don’t need a phd to make amazing videos. There are edit systems in the market that have a lot of ‘bells and whistles’. Some are costly and the learning curve is pretty high. Don’t be distracted by all the features because you may never end up using them in your video. If you’re new to editing, it’s best to stay away from these complicated systems and pick something that’s simple. Who wants to spend a lot of time learning a new video editor when you just want to edit your video? When editing a video, sometimes you’ll have three clips and other times you’ll have 20 or more. In either case, know exactly what video and audio clips you want to use. I can’t tell you how much time I wasted because I didn’t label a clip before I started editing. Have them organized and labeled correctly. Just take a few minutes and go through every clip. This could save you hours of wasted time. Silence is sometimes golden in a video but often you will need narration to convey your message. You have several options when you narrate a video. You can use your voice or have voice over done by a colleague or professional. You can also mix strategies here and have more than 1 individual add voice to your video. Make sure you have a tool that enables these options. So let’s say you have a script ready. Before you place the first edit, think about the background music in your video. Choosing the right music in the beginning can save you time from unnecessary edits. Music is important for a couple of reasons. 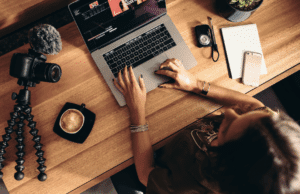 Adding music to your video will enhance the message you want to deliver by providing an emotional connection to your audience. For example, do you want your video to convey a happy tone? Then choose music that uplifts you and makes you feel joyful. When you add the music, make sure the volume mixes in with your narration. Having high music volumes could distract your overall message in the video. Animation can be a powerful tool to emphasize a point or take the viewer through a journey. Having arrows or text move across your video or using transitions from one section to another can really enhance retention and retain the attention of the viewer. Be careful when using it too much. It can cause a reaction of tuning out your viewers completely. They already get bombarded with annoying animation when surfing the internet daily. There are so many ways to visually tell a story. Our digital video editing systems today gives us a ton of options to create something beautiful. Keep practicing and it will get easier as you go. 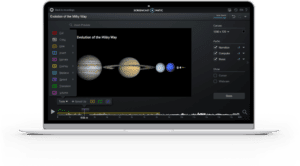 Screencast-O-Matic takes the guesswork out of editing. It has a robust video editor. It’s simple, intuitive and easy-to-use. I’ve spent years editing on various systems and Screencast-O-Matic has the easiest one around. As a Deluxe subscriber (only $18 a year), you have access to the Video Editor and all of its awesome features. You can insert video clips, narrate with your own voice, add music and even overlay text or images in your video. All you have to do is click ‘Edit’ and you have access to the ‘Tools’ menu for a list of options. 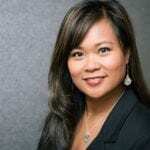 About Christine Umayam: Christine has 20 years of content experience working in television news, corporate companies and non-profit organizations. She has produced newscasts, commercials, sizzle reels and video productions during her time. She combines her love of video with marketing as a Senior Content Marketing Manager for Screencast-O-Matic.